Since I love the show so much, and since I’m such a geek, I wanted to get some Doctor Who merchandise. Luckily, ThinkGeek has plenty of Doctor Who items to choose from. My favorite are the sonic screwdrivers. For those who don’t watch Doctor Who, the Doctor isn’t one to brandish a gun and blast his enemies away. He’s more likely to outthink them. His tool of choice is a very special screwdriver that’s totally sonic. It can open nearly any door and can override computer systems. It’s the Swiss army knife of the Time Lords. Of course, the sonic screwdrivers you can buy don’t really work like the Doctor’s. Most of them are flashlights (a logical leap as the Doctor’s lights up when he uses it), but a couple are pens or even TV remotes. As I was looking through them, I began to wonder which one to get. 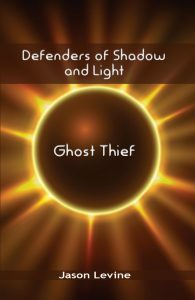 Then a thought occurred to me: Why don’t I try making one myself? I’ve long admired and envied geeks who build things. I always think I don’t have the knack for it, but honestly I’ve never really tried that hard. I’m not going to fool myself and think that my creation will fool people into thinking it’s the real thing, but maybe I could make my own passable sonic screwdriver. I’m thinking I’d start with a pen, put some kind of metal tubing around it and add some embellishments around that to make it look less like like a tube-with-a-pen and more like a sonic screwdriver. If I’m really feeling ambitious, maybe I’ll figure out how to wire up an LED light so that my sonic screwdriver pen can light up. Yes, buying it would be faster and easier (maybe cheaper as well) and yes, it would probably look nicer, but a handmade sonic screwdriver could be fun and even educational (for both me and my boys). 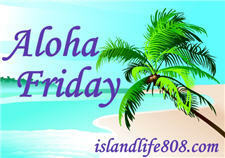 My Aloha Friday question for today is: Do you usually "build" your own items or buy them? If you usually build, any advice you can give for where to go or how to approach this project would be appreciated. 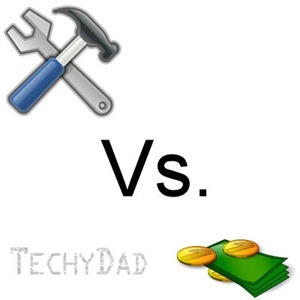 Disclaimer: The "build vs buy" image above was composed of "Tools, Hammer, Spanner" by Andy and "Money – banknotes and coin" by n_kamil. Both images are available through OpenClipArt.org. I’m afraid I can’t build much of anything, LOL! But, my husband is a very talented carpenter/handy-man. It’s nice because if I can give him a picture of something, he can probably build it. Kari recently posted..Aloha Friday – Dessert, Anyone? I’m a buyer… my hubby is a builder though. I’m with Melissa…I buy, hubby builds. Harriet recently posted..What was the last promise you broke?